Abstract. In northern Hispaniola, the Imbert Formation (Fm) has been interpreted as an orogenic “mélange” originally deposited as trench-fill sediments, an accretionary (subduction) complex formed above a SW-dipping subduction zone, or the sedimentary result of the early oblique collision of the Caribbean plate with the Bahama Platform in the middle Eocene. 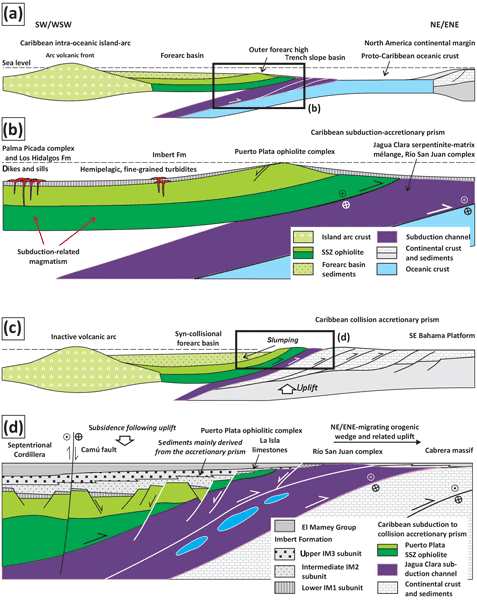 However, new stratigraphical, structural, geochemical and geochronological data from northern Hispaniola indicate that the Imbert Fm constitutes a coarsening-upward stratigraphic sequence that records the transition of the sedimentation from a pre-collisional forearc to a syn-collisional basin. This basin was transported on top of the Puerto Plata ophiolitic complex slab and structurally underlying accreted units of the Rio San Juan complex, as it was emplaced onto the North America continental margin units. The Imbert Fm unconformably overlies different structural levels of the Caribbean subduction-accretionary prism, including a supra-subduction zone ophiolite, and consists of three laterally discontinuous units that record the exhumation of the underlying basement. The distal turbiditic lower unit includes the latest volcanic activity of the Caribbean island arc; the more proximal turbiditic intermediate unit is moderately affected by syn-sedimentary faulting; and the upper unit is a (chaotic) olistostromic unit, composed of serpentinite-rich polymictic breccias, conglomerates and sandstones, strongly deformed by syn-sedimentary faulting, slumping and sliding processes. The Imbert Fm is followed by subsidence and turbiditic deposition of the overlying El Mamey Group. The 40Ar∕39Ar plagioclase plateau ages obtained in gabbroic rocks from the Puerto Plata ophiolitic complex indicate its exhumation at ∼ 45–40Ma (lower-to-middle Eocene), contemporaneously to the sedimentation of the overlying Imbert Fm. These cooling ages imply the uplift to the surface and submarine erosion of the complex to be the source of the ophiolitic fragments in the Imbert Fm, during or shortly after the emplacement of the intra-oceanic Caribbean island arc onto the continental margin. 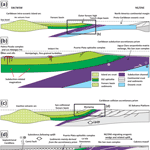 How to cite: Escuder-Viruete, J., Suárez-Rodríguez, Á., Gabites, J., and Pérez-Estaún, A.: The Imbert Formation of northern Hispaniola: a tectono-sedimentary record of arc–continent collision and ophiolite emplacement in the northern Caribbean subduction–accretionary prism, Solid Earth, 7, 11-36, https://doi.org/10.5194/se-7-11-2016, 2016.